Lees je dit liever in het Nederlands? 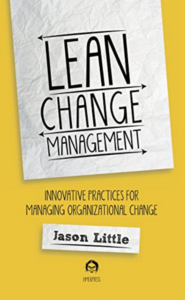 Lean Change Management by Jason Little is a compact book, stuffed with methods and advice on the “change” approach in your organisation. All information has a lean and/or agile link. Often he refers to principles from scrum, lean startup, and others, to make the concepts easier to grasp. These approaches are also compared to more known methods and models such as 7S (McKinsey), 8 steps model (Kotter) and ADKAR. The book is written for you, the reader, as a change agent. This makes it easier to use in your own environment. Jason is deadly honest in his book: the approaches he tried … and failed are also covered. Courageous! Other authors on the matter often stick too long in the analytical phase of change, but Jason chooses the more pragmatic approach. Advice is mostly tangible and hands on. Usable! I can image it doesn’t go far enough for some, but for most readers the learnings from this book will be usable as-is immediately. Everyone interested in change, with an agile mindset: this is a must read! Read more about it on Leanchange.org or buy the book at Bol!